Today, I would like to share my thoughts on a tool that has proved invaluable to both my time and memory called RoboForm. Have you ever sat, staring at a keyboard trying to cull your memory for any remnants of what a potential password can be? Perhaps, every time you try to type your password with special characters, lowercase, uppercase and numbers, you find yourself missing one or missing the Shift key? Maybe it is trying to come up with something complex, will all of those characters mentioned above without forgetting it? Have no fear, RoboForm can do all of these things and more. I personally use RoboForm everyday to not only remember my passwords but to generate complex passwords that are very difficult to remember as well. This simplifies life by eliminating the need to write down each password and store them in a drawer to easily get lost someday; adding to my overall organization on and off the job. I personally use RoboForm2Go. It is the version of RoboForm that you can install on a USB drive or external hard drive and bring with you wherever you go and onto whatever computer you end up using throughout the day. RoboForm is password protected by a master password to access all of your other passwords, so all you need to remember is one password. Between my personal and professional password protected accounts, I have hundreds of passwords stored in my RoboForm program. Here’s how it works. I can easily double-click on the account I wish to access in the RoboForm window or through a toolbar in my browser and due to the configuration of internet browser preference, it opens up my browser or a new window in my browser if it is already open and inputs the password for me — with only a double-click of a mouse! No typing! 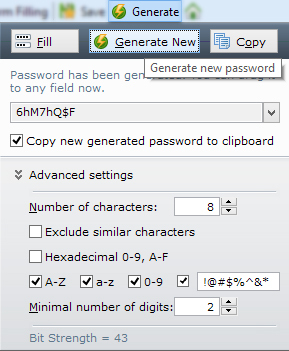 Further, if I need a new password combination, I can click on my browser toolbar and have it generate any length, character type, upper or lowercase text with numerical inputs, etc. 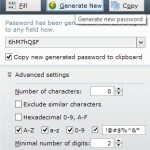 Keeping track of passwords you need to change is a snap too! All you need to do is click on the edit icon of the password you intend to change and then generate your password, copy it to your clipboard, change the password and then paste it into your RoboForm program and then hit the save button. It’s almost too easy. In short, it really makes life a simple for me to keep track of all of my passwords in a secure password protected location. I would highly recommend it for any professional on the go or one who needs help managing all of their passwords on a daily basis. Try it out, you’ll see, it is amazing. I know that’s how I feel about it, at least. Do you use RoboForm? What do you think? Does it save you both time and energy each day? 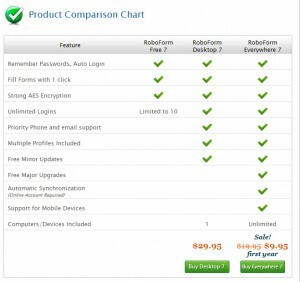 RoboForm for the desktop is priced today at a one-time $30 or you can pay an annual subscription for the “Everywhere” product to log into a website to retrieve your passwords at $10 the first year and $20/year every year afterwards. RoboForm2Go priced at a one-time price of $40. Disclaimer: I was in no was in no way influenced to write on this topic by either RoboForm or the company I work for. The opinion above is mine and mine alone. Any attempt to attribute these thoughts to any other party other than myself, is a misrepresentation of what I have written above and should be disregarded immediately.